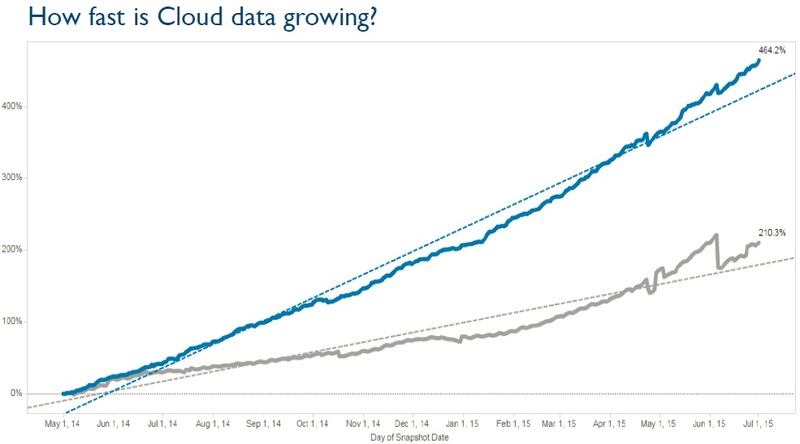 Cloud Analytics: What’s Driving Growth? | Constellation Research Inc. 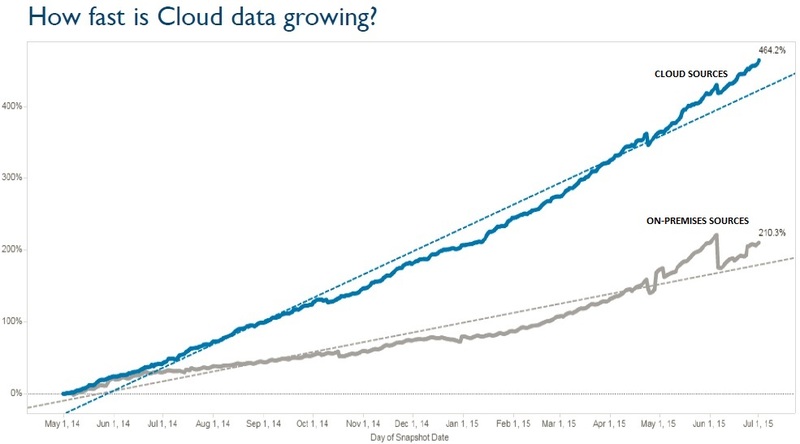 Cloud Analytics: What’s Driving Growth? Cloud-based business intelligence, data visualization and analytics options are gaining momentum as the center of data gravity shifts along with apps and services. But be prepared for a hybrid world. Cloud-based data-analysis was ahead of its time seven to 10 years ago, but as SaaS apps and cloud-based platforms and services have proliferated, businesses are increasingly turning to cloud-based business intelligence and analytics options. Name a major vendor and you can bet it has a cloud-based service already fueling growth or dominating future plans. At Tableau Software it’s Tableau Online, launched in 2013. Qlik went GA with Qlik Sense Cloud earlier this year. At IBM it’s Watson Analytics and at SAP it’s Lumira Cloud. More recently we’ve seen the headlines about Databricks’ Spark-based Databricks cloud service and Microsoft’s evolved Power BI. On-premises sources account for the majority of data analyzed in Tableau Online, but cloud sources such as Amazon Redshift and Google BigQuery are growing more quickly. A bit of history helps put things in perspective. Over the last decade we’ve seen the CRM category move solidly into the cloud, led by Salesforce and followed by Microsoft, Oracle and SAP. Amazon launched its first Web Services in 2004 and Google followed suite with the Google App Engine in 2008. With the rise of social networks and digital marketing, yet more data originated in the cloud, and soon, SaaS marketing options like Eloqua and Marketo took off. The state of the art in social insight evolved from crude counts of mentions, positives and negatives to much more subtle, industry-specific understanding of influencers, churn, content interactions and buying triggers. Smartphones, tablets and mobile apps are piling on yet more data, and the NoSQL databases that typically run these apps are often deployed in the cloud. With so much data now originating in the cloud, is it any wonder that in 2014 Amazon RedShift became AWS’s fastest-growing service ever? No surprise, too, that we’ve seen similar database-as-a-service (DBaaS) offerings from IBM (DashDB), HP Vertica and Teradata. A few of the earliest cloud BI vendors (like LucidEra, Oco and PivotLink) didn’t survive to see the cloud data gold rush. But stronger survivors, like Birst and GoodData, are now getting a second wind. And no surprise we’re seeing new pure-play cloud vendors emerge, such as Domo and InsightSquared. Among the services from on-premises vendors, Tableau Online, a multi-tenant service, is now that vendor’s fastest-growing product. Fueling that growth is analysis of data from Amazon RedShift, Google Analytics, Google BigQuery and Salesforce, in that order. But don’t make the mistake of thinking that cloud-based analysis only for data born in the cloud. The majority of data analyzed in Tableau Online is from on-premises sources linked through live database connections, synced through published extracts or uploaded from databases or files. So what’s the nature of these analyses and how are insights being put into action? I expect to hear more next week when I moderate a July 29 panel discussion in San Francisco on the topic of cloud analytics. On that panel will be executives from Tableau, Google Cloud Platform, Databricks, Birst and Tableau customer Practice Fusion. It’s a small, invite-only event, but event sponsor Tableau is inviting a short list of Bay-area journalists to cover the discussion. I’ll be asking about use cases, tips on correlating on-premises and cloud-based data, analysis approaches (SQL, visualization, machine learning or all of the above?) and how companies are coping with data at scale. Watch for my Tweets (@DHenschen) on stand-out coverage from the July 29 event, and I’ll follow up with a blog of my own on what’s driving reporting, data exploration, visualization and advanced analytics into the cloud.